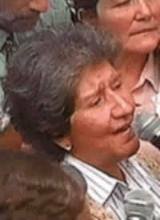 SOLA SIERRA, President of the Association of the Relatives of Disappeared Prisoners in Chile, flew into London to address a demonstration in Trafalgar Square on 7 November demanding that Pinochet face trial in Spain. As Sola awaited a decision from the Law Lords on whether Pinochet will be extradited to Spain, she talked about her organisation, the significance of Pinochet’s arrest and the opportunity this offers for justice. 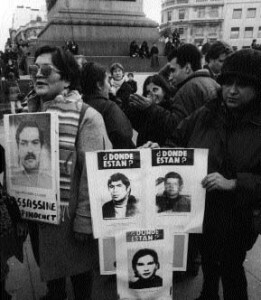 The Association of the Relatives of Disappeared Prisoners in Chile was the first in Chile to denounce the atrocities of the military Junta in the 1970s after the political opposition was crushed. In fact, it was the first organisation of relatives of the “disappeared” to be formed in Latin America and is now part of a network of similar groups in Argentina, Brazil, Peru, Bolivia, Colombia, El Salvador, Honduras, Mexico and five other countries in the region. Sola’s own organisation has seven branches in Chile and branches all over the world, including in France, Belgium, Spain, Switzerland and Britain, all working together to find out the truth about what happened to their “disappeared” relatives and seek justice for their loved ones. with documentation of the cases of the “disappeared” in Chile, both nationals and nonnationals. These files contained details of “Operation Condor” the secret police commanded by Pinochet, but which had its headquarters in Argentina. “The legal action from Spain was initiated after my organisation approached the Unión Progresistas de Fiscales España in July 1996, with evidence of the military Junta’s crimes of genocide, torture and ‘disappearance’. After the issues were raised Manuel Garcia Castellón took the case so the judicial process could be started and this has now been brought about by Judge Baltasar Garzon. When I heard about Pinochet’s arrest, I felt the need to be here. I thought, at last our struggles have borne some fruit,” Sola says. Sola has a photograph pinned to her coat of her husband, Waldo Pizarro Molina, a mining engineer who “disappeared” on 15 December 1976 because of his activities as a trade unionist and central committee member of the Chilean Communist Party. She is keen to see justice done not only for her own family but for “all the mothers, sons, daughters, wives and grandchildren who have been humiliated by the Junta and the so-called transition to democracy”. After a plebiscite in Chile rejected Pinochet’s rule in 1988 the governing parties under the new “democracy” accepted a constitution drafted by the military which made Pinochet a government senator for life. They also accepted an amnesty law which Pinochet drafted himself to protect the perpetrators. Sola says that the fact that politicians, including some relatives of the “disappeared”, have defended this form of democracy has made many people disillusioned by the political process. She argues that these “democratic” governments have dedicated themselves to cleaning up the image of the country by portraying it as united in reconciliation. see him removed from his position as senator for life and see him face trial. A poll conducted after his arrest now puts that figure at 82%,” she says. activists. One senator, the daughter of a man accused of carrying out crimes against the people, has claimed that Santiago will burn if Pinochet is tried. A thousand plus Chileans and their supporters from across the world gathered in Trafalgar Square on 7 November to demand that the former dictator Pinochet stand trial in Spain as soon as possible. “It’s justice we’re looking for, not revenge,” one of the speakers told the demonstrators. Many of the demonstrators were holding pictures of relatives who have “disappeared”. It was pointed out by Chileans themselves, including Sola Sierra, President of the Association of the Relatives of Disappeared Prisoners in Chile, that this may be the only chance they will ever have of finding out what happened to their families. Protests have taken place in London, outside the hospitals where Pinochet has been staying, every day since his arrest.